The most filmed area of the West Coast Main Line was around TEBAY and the climb to the 916 foot Shap Summit. Filmed from 1964 to 1967, motive power ranges from Coronation Pacifics, Jubillees, Royal Scots and Patriots to the work horse Stanier Black 5s, 8Fs, Standard 9Fs, Britannia Pacifics and Ivatt moguls. The magnificent scenery and very variable weather conditions are well shown at the popular location.All film material is in colour and the film has an extensively research commentary with an authentic sound track. Cover photo: Keith Pirt, 9F 92227 at Shap Summit, July 1967. Mostly filmed from 1966 to 1968, this video shows mainly Black 5s, 8Fs and Standards but is well filmed nevertheless. There are also some “Return to Steam” tours to Grange-over-Sands which are supplemented with a few minutes spent watching LNWR No.790 “Hardwicke” returning to the Cumbrian Coast in 1976 and very rare footage of the last steam hauled TPO from Whitehaven in 1985. Yes, 1985! Excellent memories of lines and views now completely changed since 1968. A video film of the lines around North Cheshire and South Lancashire from Crewe to Wigan in the days of steam in the mid 1960s. Centres visited are Crewe, Northwich, Warrington, Wigan and Widnes. Scenes on the West Coast main line north of Crewe via Acton Grange and Moore. Shed visits to Crewe South, Warrington Dallam and Northwich. Industrial steam at Northwich, Bickershaw and ex-North Staffs tanks at Walkden. 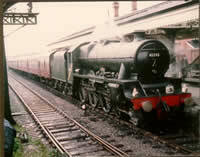 Stanier Black 5s and 8Fs, Standard Classes and WDs. This film is mainly in colour but there are some black and white views as well. An authentic sound track and informative commentary has been added bringing everything back to life in this last rundown of steam in the North-West. The previous two volumes in this series covered London to Crewe via Wolverhampton and Manchester. Before continuing our journey north, this video gives a flavour of the ex-LMS in general. 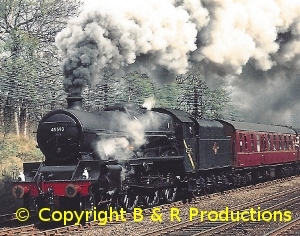 Using film from the Ray Webb collection we cover the area from Derby to Manchester, the Settle and Carlisle, the CLC around Northwith, Crewe of course and the West Coast main line to Carlisle. Filming from 1962 the motive power is a wealth of Coronation pacifics, Scots, Jubilees, Patriots, 4F’s, Super D’s, 1F’s, Black 5’s and 8F’s. There are visiting engines along the way to give immense variety. Even the demise of Jubilee “Minotaur” which crashed near Altrincham. Recommended viewing for all fans of the Midland Region. Beginning where Part 1 left off at Stafford, we leave the West Coast main line to visit Stoke-on-Trent and the Churnet Valley to Caldon and Congleton which was visited with a Black 5. North to Stockport for extensive coverage of the area through Edgeley and the engines that visited the shed there. 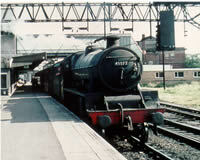 The end of steam at Manchester Piccadilly, retum to Crewe via Sandbach. The last ten minutes are spent at Crewe with not only LMS power in the form of Duchesses, Scots and Jubilees but the early electrics and diesels as well. An area covered in detail not seen before on a video.